• Gunster Law Firm has catapulted support of the Broward public school debate program to national levels with a priority for equal access for all students. • Wells Fargo directly bolsters local school communities throughout the county with support funds for quality teaching and successful educational outcomes. • For 16 years, Children Services Council has facilitated the community’s investment in children, advocating for public policy to empower future generations of successful children. 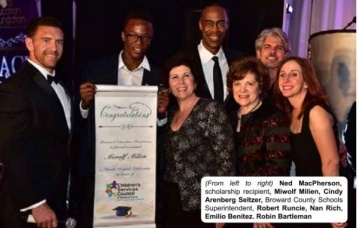 • For 30 years, Community Foundation of Broward has facilitated philanthropic support for community issues that transform lives and opportunities, funding educational programs that increase graduation rates beginning with student success in middle school. • Founders of the Broward Education Foundation include past Superintendent of Schools Dr. William McFatter; Selma Hopen, Broward County Medical Association Auxiliary; past Associate Superintendent Dr. Linda Murray; prominent educator and past Interim Superintendent Dr. Dorothy Orr; Bertha Smolian, who provided the first $5,000 Foundation donation; and Dr. William C. Drainer, former superintendent and the Foundation’s first chair, and the entire Drainer family. This core fundraising group had the vision of community participation in support of student success, which led to the Foundation’s official charter’s establishment in 1984. Proceeds from the nearly $160,000 raised during the Gala benefit the Broward Education Foundation which provides support for innovative teaching to increase student learning outcomes from pre-K to grade 12; educational materials for Title 1 school students; scholarships for qualified graduating high school seniors; and fiduciary oversight for community members who join in the educational mission by establishing Foundation agency funds. During the Gala, guests enjoyed a cocktail reception, silent auction, dinner, live musical entertainment and dancing. Sponsors were BrightStar Credit Union, JDL Technologies, Broward Health, Houghton Mifflin Harcourt, Intel, Lenovo, Wells Fargo, Arthur J. Gallagher & Co., Aetna, Avaya Communication, Becker & Poliakoff, Charter Schools of Excellence, Coventry Health Care, D. Stephenson Construction, Johns Eastern Company, Pirtle, Toyota of Hollywood, Broward Teachers Union, Cisco, Dell, Florida Atlantic University, Kelly Kronenberg, Memorial Healthcare System, The Carroll Group of Morgan Stanley, The Fischer Group, Grau & Associates, the Gunster Law Firm, OneBlood, Take Stock In Children, Partners in Education, University of Phoenix and C&F Electric. For more information, call 754-321-2030, visit www.browardedfoundation.org, like our Facebook page at facebook.com/browardeducationfoundation or follow us on Twitter @BrowardEdFound.